Preheat the deep-fat fryer to 180C. Whisk together 150g of the flour with the lager until completely smooth and liquid. Sprinkle salt and pepper over the remaining flour. 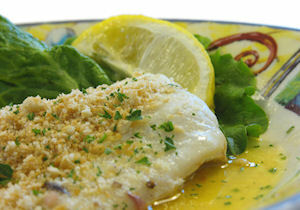 Dip each haddock fillet into the flour and then pat to remove any excess flour. Dip each fillet into the batter and remove any excess. Fry the fish in batches until golden brown on each side. Remove the fish and drain it on kitchen paper of excess fat.